This tiny Korean Fir is an exquisite garden gem, with every compact branch decorated during fall and winter with pearls---really resinous, white buds. Short, wide, deep green needles, accented with silvery-white undersides add to the plant's year-round ornamental impact. 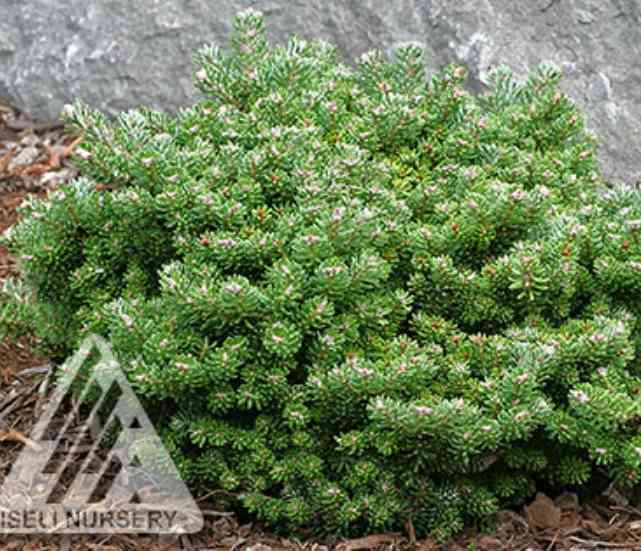 Conifer collectors will love adding this dense, very slow growing jewel to their rock or trough displays, where it will eventually take on a pyramidal form. Use caution in hot areas, where harsh rays can bleach the needles. Silver Pearl Korean Fir is a very low maintenance conifer requiring little or no pruning. It requires average well drained soil and partial shade. It will not tolerate hot, dry sites.